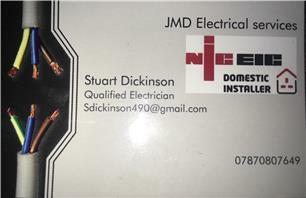 JMD Electrical - Electrician based in Brereton, Staffordshire. Hi, JMD electrical services is a NICEIC/part p registered company. My name is stuart I have 20 years’ experience in the electrical trade. I‘m Fully qualified to current 18th edition wiring regulations, testing and inspecting and electric vehicle charging installations. All work is fully insured and done to highest standard.